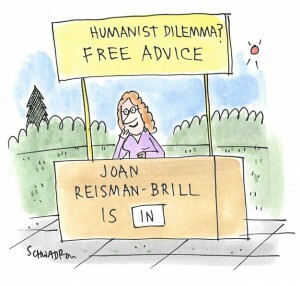 The Humanist Dilemma: How Can I Get My Mom to Stop Posting Photos of Me? Oversharing Mother: My mother loves taking photos of people, especially of family, and sharing them on Facebook. The rest of us have talked to her about why we don’t always want our photos shared: we didn’t want the photo taken, it’s not a flattering image, we don’t want people to know where we are, etc. Sometimes she understands and asks us to select which photos she’s allowed to post. However, we often see she’s shared photos that someone expressly told her not to post or she said she wouldn’t. Perhaps she forgot, but there have also been times when she admitted in the text of the post to sneaking a shot. How can we get her to respect when people don’t want their image shared on social media? Your mom’s name isn’t Gwyneth, is it? As one who has never posted anything on Facebook and is not sure how to find what others have posted, I consulted my resident expert, who said this is indeed a sticky problem. Although there are ways within Facebook to deal with the unwanted photos (untagging yourself, for example), it’s not easy or efficient. And you’ve already done all the right things in terms of asking your mom not to do this and explaining why, but it just isn’t working. Given that there’s no “Thwart Mom” Facebook command that would magically address this (maybe in the next upgrade? ), it comes down to the same thing as if your mom blabbed things you shared in confidence, or disseminated photos physically or by email. No doubt she means no harm and she doesn’t really understand or appreciate your objections and the consequences, hypothetical or actual. You could try doing an intervention by gathering all the aggrieved parties, dramatizing the worst-case downsides (e.g., family members could be stalked, kidnapped, or worse; you could alienate friends who were not included in your activities or were offended by the images; you could lose your jobs if something she published fell afoul of your corporate culture or professional standards). Warn her sternly that she gets one more chance, and if she posts anything without explicit permission again, you will take action to prevent her ability to take any photos of you—perhaps by confiscating her phone when you’re together. And if that doesn’t work, you may have no choice but to limit visits with her. Also consider whether your mother may be developing a form of dementia or other medical problems that prevent her from registering and remembering what you’re communicating. Maybe there’s more going on here than just forgetfulness, thinking it’s funny, or being inconsiderate. I hope that’s not the case, and that she finally recognizes your concerns and stops violating your privacy.